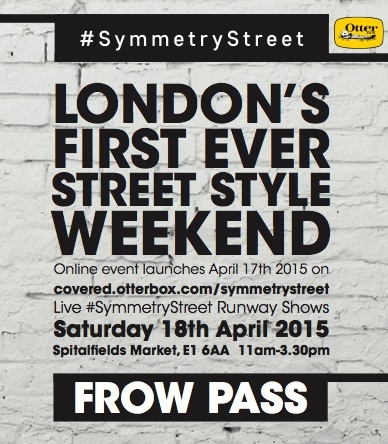 OtterBox, the number one mobile accessory brand in the US, will host #SymmetryStreet, a free celebration of all things street style, online and in London’s Spitalfields market on April 17th-18th. Mobile and fashion fans can expect an on and offline extravaganza to launch OtterBox’s new MySymmetry phone case range; emerging British designers and ‘fash pack’ Kavita Donkersley and Daniel Bruno Grandl (The Urban Spotter) will showcase their take on today’s street style. Fashionistas can an exclusive street style exhibition and get snapped by The Urban Spotter team, blogger Kavita Donkersley will be on hand to pass on her street style tips… and much more! The event will offer fans the first glimpse of the OtterBox MySymmetry range, which offers style, protection and enables users to customise their case in their own way. Register here to join in!